St. Johns is the capital and largest city of Antigua and Barbuda, a country located in the West Indies in the Caribbean Sea. With a population of 81,799, St. Johns is the commercial centre of the nation and the chief port of the island of Antigua. The settlement of St. Johns has been the administrative centre of Antigua and Barbuda since the islands were first colonised in 1632, and it became the seat of government when the nation achieved independence in 1981. Saint John is also the capital of Antigua. St. Johns is one of the most developed and cosmopolitan municipalities in the Lesser Antilles. The city is famous for its various shopping malls as well as boutiques throughout the city, selling designer jewellery and haute-couture clothing. There are also many independent, locally run establishments, selling a variety of fashions. Several museums, including the Museum of Antigua and Barbuda and the Museum of Marine Art, a small facility containing fossilised bedrock, volcanic stones, petrified wood, a collection of more than 10,000 shells, and artefacts from several English shipwrecks. Just east of St. Johns is the Sir Vivian Richards Stadium, a multi-use stadium in North Sound, that was created mostly for cricket matches, and has hosted the matches during the 2007 Cricket World Cup. The Antigua Recreation Ground, Antigua and Barbudas national stadium, is located in St. Johns. Nearby villages and settlements include St. Johnston. The citys skyline is dominated by the white baroque towers of St. Johns Cathedral. The Botanical Garden is near the intersection of Factory Road and Independence Avenue. This small parks shaded benches and gazebo provide a quiet refuge from the bustle of activity of St. Johns. St. Johns Antigua Light is a lighthouse located in the citys harbour (17.1343°N 61.9263°W? / 17.1343; -61.9263). Fort James stands at the entrance to St. Johns harbour. Other nearby forts include Fort George, Fort Charles, Fort Shirley, Fort Berkeley and Fort Barrington. Antigua and Barbuda cuisine refers to the cuisines of the Caribbean islands Antigua and Barbuda. The national dish is fungie (pronounced "foon-jee") and pepper pot. 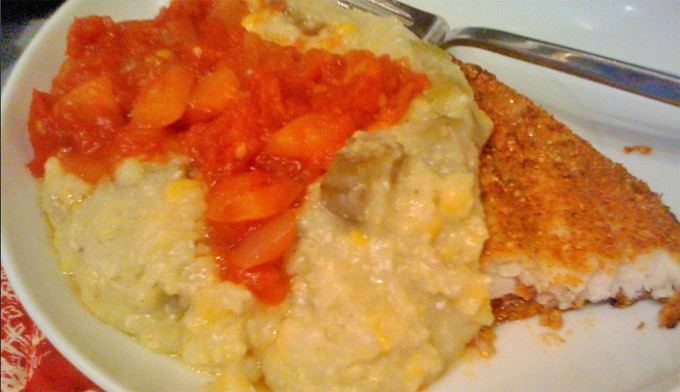 Fungie is a dish thats similar to Italian Polenta, made mostly with cornmeal. Other local dishes include ducana, seasoned rice, saltfish and lobster (from Barbuda). There are also local confectionaries which include: sugarcake, fudge, raspberry and tamarind stew and peanut brittle. Although these foods are indigenous to Antigua and Barbuda and to some other Caribbean countries, the local diet has diversified and now include local dishes of Jamaica, such as jerk meats, or Trinidad, such as Roti, and other Caribbean countries. Shawarma, an Arab dish has become popular as well, beings sold out of Arab shops along with kebabs and gyros. Chinese restaurants have also begun to become more mainstream. The supermarkets sell a wide variety of food, from American to Italian. Meals may vary depending on household income levels. Breakfast dishes include saltfish, eggplant (aka troba), eggs and lettuce. Lunches typically include a starch, such as rice, macaroni or pasta, vegetables and/or salad, an entree (fish, chicken, pork, beef etc.) and a side dish such as macaroni pie, scalloped potatoes or plantains. On Sundays many people in the country go to church and afterward prepare a variety of foods at home. Dinner on Sundays is often eaten earlier (around 2:00 pm) because people are often off from work on Sundays. Dinners may include pork, baked chicken, stewed lamb, or turkey, alongside rice (prepared in a variety of ways), macaroni pie, salads, and a local drink. Dessert may be ice cream and cake or an apple pie (mango and pineapple pie in their season) or Jello. Antiguan Butter Bread is also a main stable of Antuguan cuisine, it is a soft buttery loaf of bread that needs no butter added once baked. Many locals enjoy fresh baked butter bread and cheese for breakfast and throughout the day. There are many homes in neighborhoods all over Antigua that have small bakeries built on to them, where locals can go and purchase these fresh baked loaves. They are coupled with cheese, sardines, and a bright red sausage that locals sometimes call salami, and many other foods. They also have what is called provisions with most meals. Provisions are foods that are usually a root or starch like potatoes, yams, sweet potatoes, eddo, etc. During Carnival time souse a type of soup made very spicy with pigs feet, knuckels, and tails with lots of onions is a popular snack, sold by vendors on the side of the road. Black pudding also known as blood sausage, a well seasoned sausage made with rice, meat, and blood is also enjoyed by locals in Antigua. As you travel the roads of Antiguas country side, you will see locals roasting fresh picked corn, usually in the husk, on makeshift grills ready to be purchased and eaten. Antigua is proud to claim their locally grown pineapples as one of the sweetest types of pineapple to be found. The Antiguan Pineapple is a very small fruit but often very juicy and sweet. You can see small pineapple crops throughout the island. Local drinks are mauby, seamoss, tamarind juice, raspberry juice, mango juice, lemonade, coconut milk, hibiscus juice, ginger beer, passion fruit juice, guava juice, soursop juice and ginger beer, a soft drink. Alcoholic drinks include beer, malts and rums, many of which are made locally, including Wadadli beer (named after the original name of the island) and the award winning English Harbour Rum. Many locals drink bottles sodas that they call sweet drink, one popular flavor is punch. The locals also enjoy Red Stripe beer, Malta, Guinness stout and Heineken beer. For the Christmas holidays a special celebratory alcoholic drink that is very popular in Antigua is called Ponche Kuba Cream Liqueur, a thick creamy tan colored drink that is also very sweet and high in alcohol content.